The Narrung Sewage Treatment Works was commissioned in 1914 as a simple septic tank to service the town. By 1953, extensive works were required to upgrade the facility to keep up with the demand of the growing City of Wagga Wagga. In the late 1960's the tertiary ponds that now form the Marrambidya Wetlands were extensively remodeled to polish the final discharge before entering the Murrumbidgee River. Major improvements in aeration times of wastewater after an upgrade to the Narrung Street Sewage Treatment Plant in 2010 resulted in the tertiary ponds (known sludge lagoons) no longer being required. As a result of this redundancy, there was a need to decommission them to meet EPA (Environmental Protection Authority) Licence requirements. The preferred option was the development of a wetland in this location. Examples of similar wetlands are found at Wonga Wetlands at Albury, Fivebough Swamp at Leeton and Gum Swamp at Forbes. 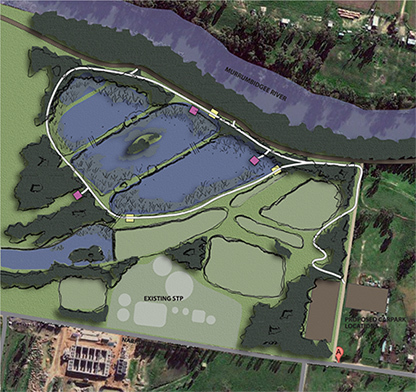 In 2011, Wagga Wagga City Council secured funding from the NSW Environmental Trust to develop a master plan for the construction of a wetland at the disused ponds of the Narrung Street Sewerage Treatment Works. The design was adopted by the Councillors at the July 2015 Council meeting. The meeting also endorsed that the project was to proceed and allocated $737,289 of funding towards completing the wetland. Of this $200,000 was contributed by Riverina Local Land Services. An additional $90,000 was contributed from Origin Energy. Key local stakeholders were engaged to ensure the Marrambidya Wetland would grow into a valuable cultural, environmental and educational site. In July 2015 the Marrambidya Wetland Activities Group was established to allow for representation and involvement in the project from various groups within the City of Wagga Wagga. See the transformation of the Wetland take shape through the below photos. It is dreamed that the Marrambidya Wetland will once again be a special place for both indigenous and non-indigenous peoples as they connect to the land. The site should be seen as an opportunity to engage with and learn about our natural environment, and also a space that we can use to reflect upon our own individual connection to country from wherever we reign. 120,000 years before present The Wiradjuri People start to settle in the region. 1829 Early colonists first sighted the land on which the flourishing City of Wagga Wagga now stands. 1849 Wagga Wagga is proclaimed a town. 1914 The Narrung Street Sewage Treatment Works were commissioned and serviced the City of Wagga Wagga. 1946 Wagga Wagga is proclaimed a city. 2010 The Narrung Street Sewage Treatment Works is upgraded under the Sewer2010 project allowing the decommissioning of the sewage treatment ponds. June 2012 Upgrade of Narrung Street Sewage Treatment works completed with the installation of a Sequential Batch Reactor, rendering the treatment ponds redundant. February - March 2013 Plans for the Narrung Street Wetland redevelopment go on public exhibition. 13 February 2016 The Healing Place is officially opened to the community on the 8th anniversary of Apology Day. June 2016 The Marrambidya Wetland is officially opened with an official ceremony on Friday 3 June. A community celebration event was held at the wetland on Sunday 19 June.